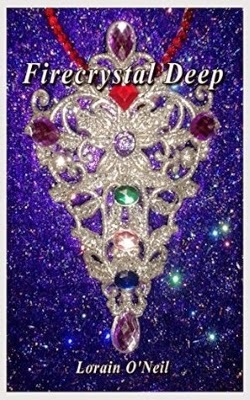 FIRECRYSTAL DEEP by Lorain O'Neil is a humorous sci-fi romance with a heavenly twist! Retired schoolteacher Miri Prescott is a God. Surprise! Waking up in a spaceship, kidnapped and back in her eighteen year old body, isn't the kind of thing that's supposed to happen to Miri. But with everyone insisting she’s the Adrus, the lost given God of the Adruminion, relentlessly lusted after by the Demesdom, it just isn’t doing her any good arguing that, heh, she can’t even tweet! Spirited away to the Adrumininum, Miri learns that it’s an empire ruled by her former (who’s quite definite on being her current) mate, and that it’s at war with the Demesdom, a realm ruled by the man she once desired. Two vast galactic kingdoms ruled by alpha males each ferociously in love with her and willing to stop at nothing to have her. Which makes befuddled Miri one reluctant Adrus. Or maybe little Earth-human Miri has a mighty big secret --of what was left behind back on Earth.